Dr. Lesse does not even pay lip service to the possibility that Tommy's strong reaction to the test was not simply a fear of needles, but a fear of being exposed as a liar. This is very suspect. And so, an important objective for the upcoming interview must be to force Tommy to admit exactly what was discussed between him and Martha, exactly how he felt towards her, exactly what was going through his mind through every step of their interaction, and exactly what she was saying and doing throughout every step of their interaction. Again, if he is only being questioned on abstract, matter-of-fact details, then it will be too easy to distance himself emotionally and intellectually from the truth. You must not take "I don't remember" for an answer. When he is called upon to paint a full color, multi-dimensional, and emotional portrait of exactly what happened, it will be that much harder for him to fabricate lies. This line of questioning will lead to a more vivid explanation of that night's events, and probably expose other deceptions or omissions. Another means by which to prod Tommy into revealing more to us is to use the Academy Group report for leveraged questioning--an idea which belongs to Jim Murphy. Using the report's perpetrator profile and its specific details about the manner in which the initial assault and subsequent bludgeoning occurred, Tommy can be questioned in such a manner that, if he is truly guilty, he will be thrown fiercely on the defensive. Re-reading the report immediately before the interview should prove helpful. According to Tommy, soon after he returned from his sexual encounter with Martha Moxley, he went into his father's bedroom and watched The French Connection with Ken Littleton. There exists, however, a curious discrepancy between the time Tommy says he joined Ken and the time Ken recalls Tommy entering the room. Littleton actually places Tommy in the room twenty minutes before the famous chase scene, while Tommy says he arrived only ten minutes before. 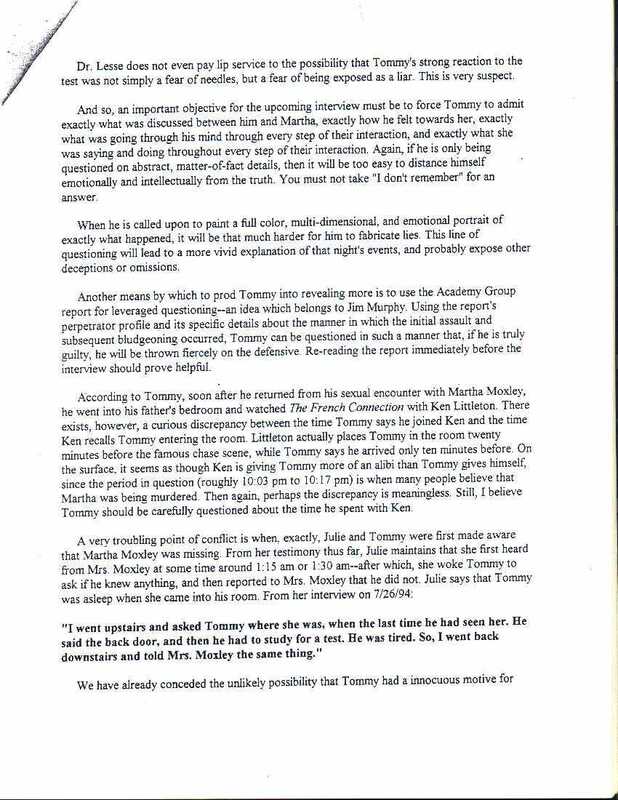 On the surface, it seems as though Ken is giving Tommy more of an alibi than Tommy gives himself, since the period in question (roughly 10:03 pm to 10:17 pm) is when many people believe that Martha was being murdered. Then again, perhaps the discrepancy is meaningless. Still, I believe Tommy should be carefully questioned about the time he spent with Ken. "I went upstairs and asked Tommy where she was, when the last time he'd seen her. He said the back door, and then he had to study for a test. He was tired. So, I went back downstairs and told Mrs. Moxley the same thing."